I was asked awhile back which taco establishment has the hottest salsa. King Taco certainly is in the conversation with their infamous salsa roja. The same goes for el taurino(same salsa). Cactus taqueria has a spicy salsa roja and some nights they have a habanero salsa.On the westside Don Felix used to have a intense habanero salsa but they've since started serving a milder version. Some habanero salsas are tempered by other ingredients such as tomato or tomatillos. 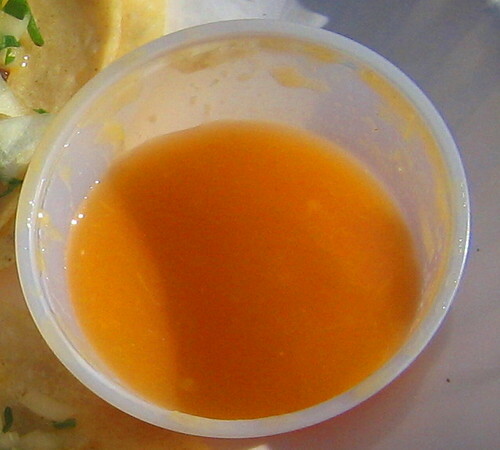 Not the habanero salsa at El Super Taco(pictured above). It's basically a straight habanero blend with maybe some lime or water to thin it out. The heat is intense and there are three stages.First it burns your lips and tongue. Then it fills of the sides of your mouth and hurts your temple and makes you instantly start to profusely sweat like you've been sitting in a sana for 30 minutes. Then it settles down your throat and the spice doesn't go away. It just stays there..and it starts to hurt actually. Then there comes a point where no amount of water or bread or anything will help you. You have to just wait it out. There is plenty of warning though. The salsa is labeled "very very hot". My local taco hut in the south bay is amigos tacos and they have a pretty intense habanero salsa, but i'm curious to try el super taco. my own chile awakening came during a sandwich with too much dave's insanity and i was left writhing on the ground. i realized i had looked over the edge. now the pain is merely a glimpse of what's to come. in other heat talk though, tonight i had the most intense searing i've felt since that dave's incident with some chinese s&b hot mustard. holey schnikes i thought my nose was about to erupt. but then, like all mustard, the whole incident was over in about 3 minutes. wild. A couple of weeks back I went with some friends to El Taurino. One of them foolishly decided not to order a drink, but got their roja on his tacos. Moreover, these were the first real tacos he'd had in five months, having spent the interim in the taco wilderness of Rexburg, Idaho. About three bites in, he was begging for some of my Diet Pepsi. His face was so red, it looked like he'd just spent a half-hour outside in an Idaho ice storm. 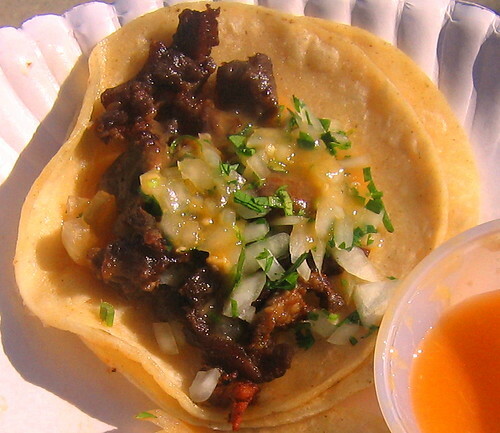 Hey i just got turned on to this site, its my new favorite, anyway i am also in search of the best taco in the l.a. area some places you might not have gone to are in pasadena there are 2 taco trucks on fair oaks that have pretty decent tacos and really hot salsa. C'mon Bandini, it is about taste, not just heat. 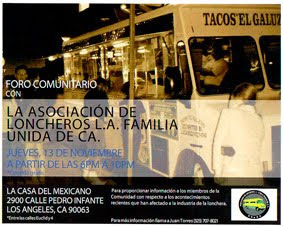 And having visited Carnitas Michaocan (No. Broadway at 19th) yesterday, their salsa roja once again proved its superiority. The habanero at El Super Taco needs to be treated as a unique addition to the palette -- a few drops on top of their good/medium salsa roja, over their nicely spiced al pastor with the grilled onions, with perhaps a squeeze of their tiny lime segments over. Bandini, you need to get yourself to Lupe's. Down the hill from the original King Taco, they have KILLER east L.A. salsa. Or you can join me and my buddy when we make our special killer Harbanaro chicken wings. It's not salsa, but I can guarantee you will die from it. Hype1.com covers everything related to Entertainment and Nightlife, such as Nightclubs, Event Photos, Restaurants,Special Events, Event Tickets, Maps, Photos, Dating, Hotels, Hot Spots, Event Promoters, Fashion Shows and More! On Hype1 you can plan your night by viewing thousands of nightclubs, events and restaurants across many cities in the world. Remember , going out is easy, knowing where, is not. From the color it looks to be made from habanero. I also had that exact hot sauce at Mi Lindo Yucataen in San Francisco, a place that specializes in Yucataen. One taste and it burned my mouth for 5-10 minutes. There used to be this place right off the Soto St. exit near county USC hospital. It was call Oroscos Tacos it it had BY FAR the hottest salsa I have ever tasted. Nearly impossible to eat. Sadly it was run by one guy and I think he just got sick of doing it and I have not seen it open in a very long time.